GLENDALE, Ohio -- While most people were getting ready to pass out Halloween candy, Jennifer was decking the halls. She and her husband, Bart, live in an 1855 home known as the McLean-Johnston house. It's one of the stops on the upcoming Glendale Holiday Home Tour, set for Saturday, Dec. 1. Jennifer has plenty of reasons to start decorating early. Not only is her home a stop on the Glendale tour, she's also planning on 28 houseguests during the holidays. And she puts up a lot of decorations -- 30 bins full. It takes her a week to get them all on display. "It's a labor of love," she said. "I try to decorate with the stuff that was from his family or my family." Those heirlooms include postcards that belonged to Bart's great-grandmother and remain in surprisingly pristine condition as they adorn a small Christmas tree. The silver-plated bells hanging in a doorway are annual gifts from Bart's mother. 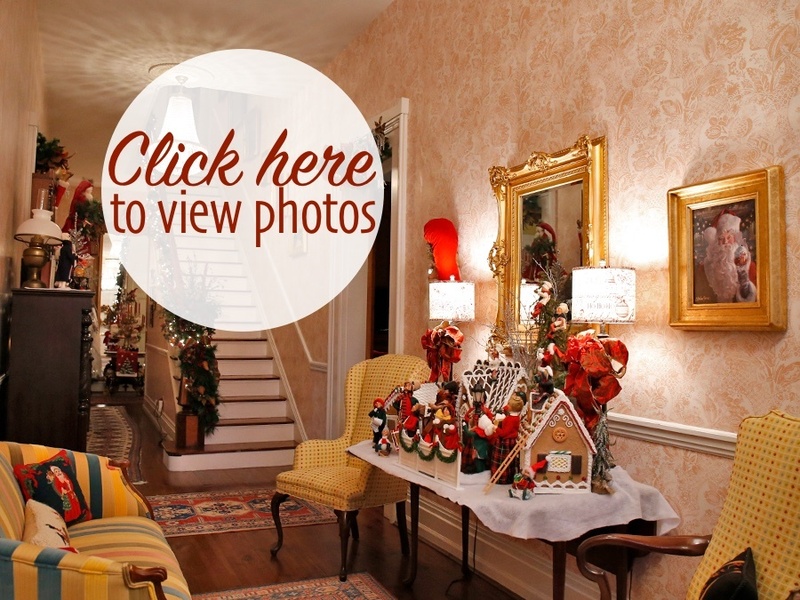 In addition to the holiday decorations, the home is filled with antique pieces, many with family or personal connections. Jennifer has a background in interior design and period furniture, which has served her well in decorating her home. She inherited that interest along with the many family heirlooms: Growing up in New England, her grandmother was an antique dealer. Jennifer has family pieces that date to the 1700s. She also has lots of collections, such as the 25 doll carriages that are on display throughout the house. "I have little ones and big ones, and they're all antiques," she said. It started at a flea market some 25 years ago, when she bought a carriage that reminded her of an old one she had as a child. "I started collecting them just on a whim," she said. Other interesting pieces fill the home. Various antique buttons handed down from her family fill a frame. A grandfather clock in a corner once stood in the girls' academy she attended for high school in Massachusetts. Antique dolls and 1800s clothing have been handed down to her, and she has added her own finds to those collections, too. "It actually has a lot of history to me," she said. The house itself has a long history, too. Originally built for Col. L.C. McLean, it's postcolonial in style and once sat on seven acres. It has served as everything from a residence to a hotel to a boys' home over the years. Jennifer and Bart bought the home 12 years ago. Part of its appeal was "it could hold all of our collections," Jennifer joked. "For the age it was, it was in overall good shape," she said. Still, they've made a lot of improvements, including putting in new box gutters and 64 new shutters. To efficiently control temperatures in the 10,000-square-foot space, they installed a geothermal heating and cooling system. Other changes have allowed them to put their own stamp on the home. They remodeled the kitchen, updating the cabinets to coordinate with the existing granite counters. A large patio they had added, which features bluestone slate and cathedral stairs, won a state architectural landscaping contest, Jennifer said. In the basement, they combined a few small rooms to create "Jen's Pub," which has an old European feel. Tour goers can see the couple's touches to the home, as well as its original features, like soaring ceilings and original banisters, on the upcoming tour. "We were so thrilled to get this house," said tour chair Arleen Hoeweler. "She decorates unbelievably. Her collections of things are so unique. And the house is filled with history. It's three little diamonds all in one." The house is one of eight structures, including six homes, that will be decorated for the holidays during this year's tour. Most of the buildings are historic. The biennial tour is a fundraiser for the Harry Whiting Brown Community Center. "This is Glendale's day to shine," Hoeweler said. "We want to show everybody what we have to offer." Where: Start at Harry Whiting Brown Community Center, 205 E. Sharon Road, in Glendale, or Christ Church Glendale, 965 Forest Ave., in Glendale. Tickets: $20 in advance at Bluebird Bakery, A Village Gift Shop or CF Bank through Nov. 30. $25 day of tour at Harry Whiting Brown Community Center or Christ Church Glendale.